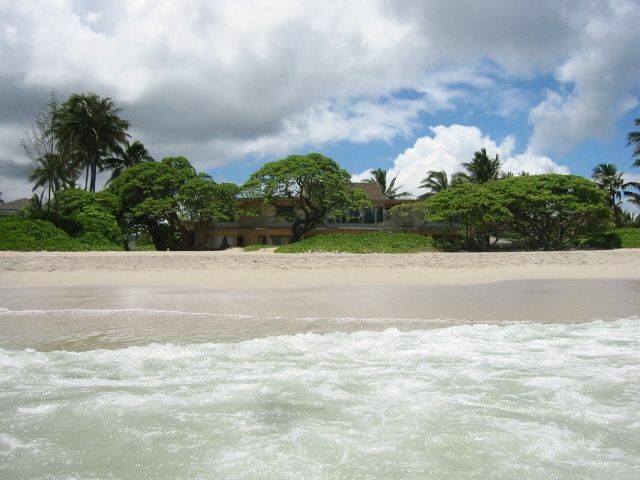 Kailua Beach House is a casual, simple, two-story beachfront home with 6+ bedrooms, 4+ full bathrooms, fenced property features a large, free-form swimming pool which has a poolside cabana with gas BBQ and a outdoor hot/cold shower. The property decor features light colors, pastels and tropical prints and has quality furnishings and appliances. The beachfront living area has an entertainment center with TV/DVD, stereo. No weddings, receptions or parties allowed on the property. This is a simple beach house. Property has ceiling fans throughout, but is not air conditioned. House is in need of minor maintenance, a few beachside windows need to be replaced along with a few other items. No phone service, use your cell phones. Cottage located on the property may be rented separately. Cottage occupants do not have pool or BBQ privileges. Caretaker lives in separate unit of Guest Cottage with private entrance and cat on premises. Upper deck is for emergency use only, unavailable for guest use. Property is adjacent to a well-used public beach access. One of the upper bathrooms is a Jack and Jill type bathroom with 2 entrances, 2 sinks shared toilet and bath/shower. Parking for 1 car in garage, ample parking in gated driveway for 2-3 additional cars. Indoor dining seats 12 while there are 2-3 outside tables and chairs for poolside dining. Total of 14 people. Plenty of bathrooms; rooms were clean and overall condition of the house was very good. Plenty of parking. Lots of beach towels, chairs, toys, etc. House could use some updating, but hey . . . . it's a beach house! Really the only criticism are some of the fixed windows; would suggest they be replaced with windows that can be opened, to enjoy the wonderful breeze. FAMILY REUNION HOLIDAY TO CELEBRATE A 70TH BIRTHDAY. WE HAD SEVEN WONDERFUL RELAXING DAYS WITH THE WHOLE FAMILY OF 6 ADULTS AND 6 KIDS (6 TO 12 years) AND WANTED TO STAY LONGER. THE LOCATION AND HOUSE WERE PERFECT FOR OUR NEEDS. BEING RIGHT ON THE BEACH, PLUS COMPLIMENTED BY A GREAT POOL. WHILE SOME MAINTENANCE AND RENOVATION WORK (DECK AND SOME WINDOWS) IS REQUIRED AS IT IS AN OLDER PROPERTY, WE FOUND EVERYTHING FUNCTIONAL. ANY NEEDS OR QUESTIONS THAT WE HAD, WERE QUICKLY ADDRESSED. OUR CHILDREN SUMMED UP OUR STAY, BY SAYING THAT IT WAS THE "BEST" HOLIDAY. Absolutly incredible view of the beach! This house has the most incredible beach view!! Fell asleep every night listening to the sound of the waves. Older home, very clean, could use a little renovations, but it was just perfect for my family of 15. Eight bedrooms, which gave us plenty of space for everyone. We spent hours enjoying the large pool and big backyard. Caretaker was so helpful and made sure we had everything we needed. Great location, close to a Safeway market, Target, and lots of restaurants. I would highly recommend this house and plan on bringing my family back to Oahu and staying in this home again! Our family spent two weeks here and had a fabulous time. You can't get closer to Kaiula beach; and the pool and patio area was great. The covered patio area was a great place to eat and hang out. Angelene , the caretaker was friendly and helpful. They advertise 6 bedrooms, but there are really 7 ; however, you must pass though the upstairs master bedroom to get to two bedrooms. Might be a privacy concern for some. Can't use the lanai overlooking the pool. A lanai overlooking the ocean would be awesome. The house needs some updating , but you're on vacation. Our family of 12 had a wonderful week celebrating my husbands 80th birthday. The location was perfect right on the beautiful beach. The pool was recently re-done and looked beautiful. The patio and barbecue area was a big asset and we ate outside each night. as did the kitchen but it all worked well for my family. Couldn't have had a better time!!! Kailua Beach is located 15 miles east of the airport and Waikiki across the Koolau Mountains on the Windward coast. This serene residential area has no hotels or vacation rental condos and its three miles of reef-protected, white-sand beach is ranked among the very best in the USA. Windward Oahu offers several golf course, tennis facilities, water sports activities, a variety of restaurants, grocery stores, theaters, a shopping mall and the consumer services typical of most suburban areas. 5/7 Night Minimum, Rate is for 12 people. Additional charges for occupants over 12. Rates do not include 2019 14.962% Taxes X-Mas rates available upon request, 12 night minimum. No weddings, functions, or parties allowed.